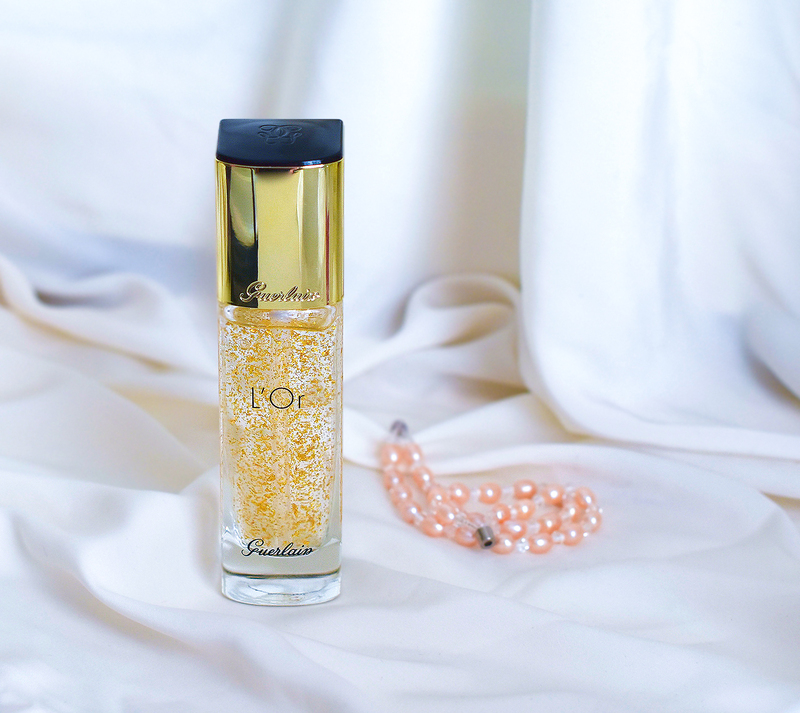 Today I want to share with you my experience about this Guerlain L'Or Pure Radiance Face Primer.
" The 24-carat gold-infused cooling gel sinks into the skin, retaining moisture. Applied to bare skin, this skin enhancer and makeup primer smoothes fine lines and tightens facial features. It also provides an even finish under makeup". This is my first ever beauty product that contains pure gold complexion-perfecting flecks. The packaging is absolutely adorable, as you can see. Now, let me talk about the primer itself: This Guerlain L'Or Pure Radiance Face Primer is basically jell consistency with gold flecks in it. I can't say anything about the claim that it tightens facial features (I don't feel anything like that while applying it) but let me tell you __ my makeup has never looked so radiant and glowly before. To be honest, I've been so disappointed when I was looking for a best primer for my dry, sensitive skin that at some point, I started skipping a primer before a liquid foundation. This Guerlain L'Or Pure Radiance Face primer does everything I need from a good primer: it absorbs quickly (those gold flecks melt into the skin), doesn't feel heavy on the skin, makes perfect base for the makeup, my liquid foundation glides on it, it doesn't look caky, and at the end of the day, my makeup looks as great as in the morning. It makes my skin glow without any oilness. Even my husband asked me what kind of makeup I've been using that my face was glowing. The only downside is the price, what can I say, it's very expensive ($74) but I am happy, I purchased it. Have you used this Guerlain primer? Did it work for you too? Let me know in the comments below and have a fabulous day. This product looks amazing. Guerlain is a great brand! This looks so pretty and sounds great. Very expensive but it sounds like it works well! I know, it's very expensive. 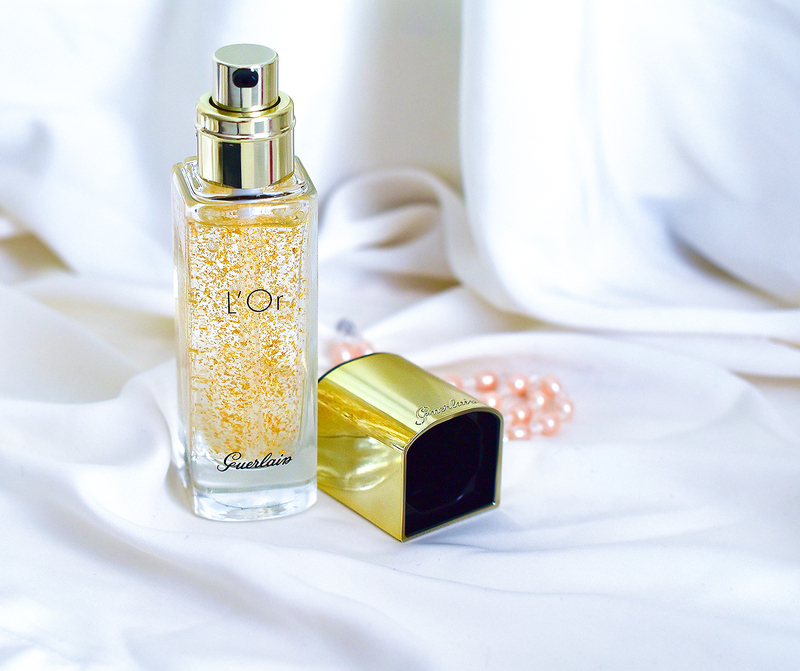 I love a glowy makeup and this Guerlain primer with gold (wow!) seems to be great! I like Guerlain, and I like gel products, so I will be checking it out (soon at a Duty Free shop, I love browsing) and would love to buy it! Hope you have a nice day! This has gotten amazing reviews by many! Thank you for your review, Nina! I love trying new perfumes! This is such a cute bottle, too. This primer looks amazing! It must perfect! Thanks for sharing! I like that it contains gold, i guess that's why it is expensive. great review. I love Guerlain fragrances and I'm positive I'll like this too. Will check it out. This sounds like a wonderful primer! Not only is it beautiful to look at and can double as nice vanity decor, but it actually works! I love that it allows for the makeup to last all day. I've been trying out a number of primers and I haven't been able to find one that does that, it can look quite cake-y at the end of the day, even if I didn't apply a lot of makeup. I'm at the age where if something really is worth it, I'll pay the higher price, so if that's really all there is as a con, that's pretty awesome! Thanks for sharing and I hope you have a great weekend! I have seen a lot of people with this one and I am so tempted to buy it but it is also so expensive! I keep seeing this Guerlain Primer everywhere, yet most of the reviews I've read so far only mention the tightening effect and none of them really talk about the radiance so your review is very interesting to me! It looks beautiful - the gold flecks are so special :) It's really ncie to hear that you like it and enjoy using it, even though it was expensive it's great you are so impressed with it despite the price. this primer does sound so amazing, definitely a 'treat myself' kind of product. I didn't try out this primer so far ... it is really a pity that the price is so high. I've heard quite a lot of good reviews on the product, my only hesitation is its effect on oily skin as I'm one of those people. 74€ is quite a tidy sum. I can't say anything about oily skin dear, becasue I have dry skin, and I agree, the price is really high.